Of course, a lot of Mrs Lighty’s curiosities are naturally associated with Baby Lighty. I didn’t realise how much a baby laugh would light up my world, but I’d still love to know the recipe for eliciting that laugh. Sometimes you laugh at seemingly the most random of things, Baby Lighty! Just what is it that’s making you laugh?! I’d love to know! Similarly, I’d love to know what you’re talking about. When you babble away in your gorgeous little baby language, what are you trying to tell me? Similarly, when you’re talking to yourself in the iPad camera, what are you telling your little mirror image friend?! I know I shouldn’t wish your little life away, as all too soon you’ll be saying real words, and this precious baby language will be gone forever, but I’d still love to know what you’re saying! 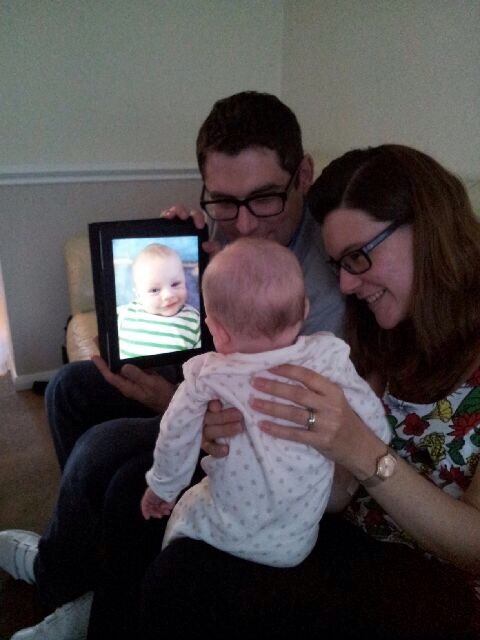 Baby Lighty talking to a video of himself on the ipad! And finally, I’d love to know what you’re dreaming about, Little Lighty. When you’re cooing in your sleep, or even cuter still, when you’re laughing in your sleep, what is it that you’re seeing? I can’t wait to nurture your dreams in years to come and hopefully see them come true, too. But in the meantime, sweet dreams and dream big, little boy! I’d love to know what Baby J is staring at! He’s always looking off into the distance at something even if there’s nothing there!! Haha! Don’t they say that when a baby is looking into the distance in a photo, they are looking at a loved one that has passed on but has come to visit? I absolutely loved reading this post! Number 1 & 2 spoke to me sooo much. I always ask/shout at hubby when he asks me to pass him things, asking how he would cope on his own all day! My neighbours have nicknamed my baby the noisy baby, whoops!